As mentioned in the January issue, Don Hall and I spent numerous hours together attempting to take a look at the various aspects of the automobile industry for this two-part interview. Several people have asked how Don and I got together on and the idea of this article came to be. In June of last year, you may recall the torrential floods that devastated West Virginia and in particular Greenbrier County where there were 27 deaths and many families left homeless. I went to the Greenbrier Resort in August, met with Don and the past president of VADA, William Farrell. 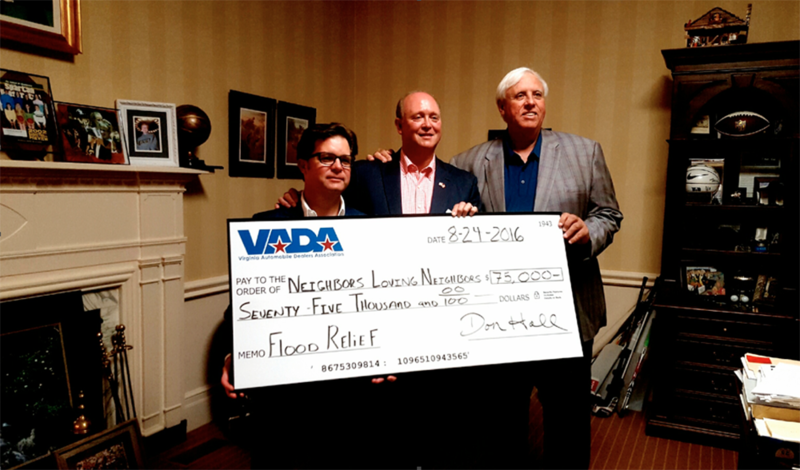 Don invited me to his meeting with the owner of the Greenbrier and now Governor Jim Justice whereby Don and William, on behalf of VADA, awarded a $75,000 check to be distributed to the families who lost everything in the flood. I was quite taken with the heartfelt generosity and compassion this gesture radiated. From there, Don and I became friends and as that relationship developed, I more clearly understood what a dynamic and intelligent man Don represented and that his story should be told. Don came from a very broken family, a rough childhood and left to learn on the streets of Los Angeles. At 16 he left home. 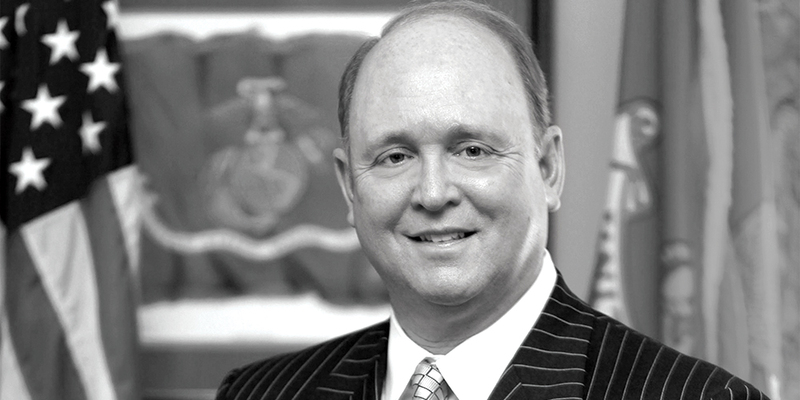 At 17 joined the Marine Corp where he, to this day credits his salvation and discipline. After a brief stint in banking, he began his auto career in 1979. He has held several auto retail positions; salesman, F&I, sales manager, GSM, and GM. The long and short is, Don not only knows the business, he has lived the business. His passion and empathy for dealers coupled with his personal work experience provide Don with a 360 degree of vision. Thus, he sees this industry with total clarity. In writing this article, Don and I are striving to address many of the questions we are hearing from Dealer/Principals across Virginia as well as the country and deliver what we appraise as helpful guidance on many of those issues. This I have learned – All Dealer Associations are not created equal and the reason Virginia’s is so strong, influential and well respected is that, as Don likes to say – “We are the point of the spear”. Don is a very wise Dealer Association CEO and possesses an uncanny talent for fighting for his dealers in our State of Virginia. Having become friends with Don, I can tell everyone that I would feel extremely comfortable having a warrior like Don representing my Dealership’s interests. He is valiant in his service towards everything he does. So Don, How would you summarize the industry right now? This is a very exciting and challenging time to be in the automobile industry. What makes it so exciting is the new technology being developed. Consumers want and deserve it and we are happy to deliver it. One challenging area is; I feel the manufacturers need to develop a much better relationship with their dealers. They often levy rules and regulations and often make unreasonable demands upon their best customers – the dealers. They put tremendous pressure on the dealers to perform, sell, build, report, service and do whatever the manufacturer sees fit. There is not a dealer I know that does not want to do better in facilities, sales, service and developing better relationships with their customers and strive to do so every day all on their own. Sometimes the manufacturers think they can do a better job from their respective offices utilizing a recent theory-driven college graduate who has never sold a car. The reality is that these people should work in a dealership before they begin slinging demands and heavy-handed structure to the dealers. There is some work needed in this area going forward. Manufacturers are caught all the time with their hands in the cookie jar like posting fictitious numbers yet they will point fingers at dealers like the dealers want to sell fewer vehicles. I don’t know any dealer that wants to sell less. Manufacturers have never looked at their product as being the issue instead it is always the car dealer. For instance, depending upon the market they are in, domestic manufacturers put pressure on their dealers because they are not competing equally with the imports overlooking completely that consumer perception feels that the import is a better quality brand. Recalls are at an all-time high. Maybe the manufacturers should spend more time evaluating the products they are building instead of depending upon the dealers to fix them later for them, then wonder why the dealer has difficulty selling their product. How do you envision the future developing for the industry? We cannot, in this industry, rest on our laurels. The technology I mentioned before means automobiles are racing into the future. Technology must make the consumers lives’ easier – whether it’s an oil change, warranty work or finding the right car for them, auto dealers must be ready to meet their consumers’ needs in an efficient and sophisticated manner. The industry has many great partners that help in this area – Cox Automotive, for example, is a great asset to dealers in this regard. We are on the cusp of massive changes and dealers must embrace these changes and continue to evolve or tomorrow they will be outdated. It is critical for dealers to employ individuals who embrace this technology in order to best utilize it. I have to point out and I know Chuck agrees that technology alone will never grow your business. Sure you can have all the numbers, ratios and widgets but you will only have those if you neglect the important things. The other components that have to be looked at are what does your employee training look like and what do your processes look like. If these two are missing on a cylinder or two your technology will not save you. These two are so overlooked because they are perceived as unnecessary expenses but the reality is the expense of not doing them right far outweighs the cost of training and developing good processes. The number one asset every dealer needs to pay attention to is the consistent Care and Concern for their people. It has to be front and center for the industry to enjoy future growth and gain respect from consumers. We know the traditional pay plans need to change. What should Dealers do regarding this in the coming years? This may not be very popular but I have said for years that the idea of commissions sets car dealers against customers from start. There is a push/pull that goes on that leads to a lack of trust from the customer. From my experience, I have witnessed that when you have salespeople who are desperate to meet their goals, desperate people do desperate things. I am a big advocate for salaries and fewer hours. I think if you want to attract smarter and younger people in this industry and keep them; they are going to be looking for a better quality of life. Better salary, more vacation, healthcare etc. If the auto industry is going to compete for these well-educated individuals to come work, you must compete with what other industries are offering. Salaries are the future. It requires more management of your staff, but that is why dealers hire the managers – in the end, it will create a much better environment for customers to come in and buy cars. Additionally, it would make sense to me and others that the GSM, parts manager, service and sales managers all be tied to a central compensation structure that is related to each department doing well. This way you have them all working in the same direction for the same reasons. Each would have to care about the well being and development of the other dealership’s departments. All of a sudden you have the service manager or director asking the sales department “how we doing this month” and vice versa because 28% or so of their compensation comes from the front or back end successes. Then you begin hearing things like “what can we do to help sell more cars in the service drive” or “how can we deliver more customers to your service lane”? If every dealer’s website (OEM mandated) looks the same as their competitors’, what can they do to differentiate themselves and stand out in the market? While I am no expert on technology and websites, I do know that manufacturers do their best to make all dealers look the same. From the standpoint of a dealer who works hard to build his or her business; I believe they should be allowed to pursue their own innovations and autonomy. I am not a fan of OEMs mandating websites and designs. We can certainly learn from OEMs, but dealers should be able to customize their customer experience based on their location. It is all about creating a customer experience and this takes away from it. Think about the five, six or seven dealerships in your marketplace where consumers can buy a vehicle within an hour’s drive. Then think how does the consumer figure out whom he or she should do business with if everyone looks the same? Every dealer should be thinking about developing a difference between their competitors. This cannot happen if everyone has a cookie cutter approach. Frankly, if every dealership looks the same, says the same and acts the same then we have lost the competitive, industrious and creative spirit and the consumers lose. I am told there is no credible industry standard for customer reviews. Do you think an unaffiliated third party that embraces more transparency could help dealers build a greater level of trust with consumers? Talking about CSIs and how the customer evaluates the purchasing experience, I recently had a conversation with an OEM about questions being slanted a certain way, leading the customer to be negative against the dealer. At the end of the day, is the dealer continuing to sell cars, service customers and bring in new business? If yes, then you know they are doing their job. If you are compelled to have a survey to measure your customer’s happiness, then absolutely you should have an independent, third-party administer the survey. Too many times surveys can be made to give you the answers that you are looking for, which is a big reason why I and many consumers do not like surveys. Transparency is the buzz word of the hour – and I think there ought to be great transparency in this. I do not believe those dealer councils should be allowed to sign off on these questions – as they tend to say whatever the manufacturer wants to hear. A novel idea; why not have associations get involved? Let us sit down with manufacturers and experts to develop a truly independent survey that allows us to measure a customer’s satisfaction. As I said, if the dealer is continuing to service, sell and promote their business – then that should be more than enough information to determine the job they are doing. In most small to medium size dealerships there appears to be little to no business and marketing planning. How important do you feel this is to run a more corporate-like organization? I love the small/medium dealers in Virginia. They are the backbone of what created this association – always the first to support our initiatives and be at our events. I find that bigger organizations tend to insulate themselves and are not as supportive as they ought to be. The bottom line is this: if you are going to be in business today as a small or medium dealer, you are going to have to look at your larger competition and replicate what they do. It’s a tall order and a tough mountain to climb, but to exist in a two-tier system, which I am adamantly opposed to, these small dealers must adapt or be squeezed out of business. These dealers must embrace the new technologies, training, and advances of the auto industry. Studying, sharing and discussing the store’s numbers every month with every manager in one meeting is the way to get everyone on the same page, looking in the same direction and developing departmental accountability. Wishing and Hoping is not a business strategy. Being active in the community, establishing relationships and always looking to promote and improve your brand is essential to thriving in this industry. Your culture must be 100% in or they will be left in the cold. Embrace the change or they will not survive. In planning, I don’t want to talk about detailing 2017 I want to look forward to the next 15 years. I don’t want to spend one nanosecond on history only forward thinking. Don, on behalf of Dealer Magazine and our readership community I want to thank you for investing so much time, energy and commentary for this article. You have extended every possible professional courtesy to me at every turn and I thank you. Again, both Don and I welcome your comments and/or questions so please take the time to email us and we will team up to get back with you. From left to right – William Farrell, Don Hall, Gov. Jim Justice. I also visited with a few Dealers in the State and asked them how they envisioned VADA. “Don Hall leads our voice. He is our gateway and bridge to our delegates and does an awesome job representing Virginia Dealers. Compared to other associations Don is the best. He is a true leader”. “VADA is the best in the country. Very well run. They help put legislation in place to protect family business, compliance issues, recalls and dealer rights to mention a few. It is comforting to know that Don is someone who always has your back”.